PAHOA, Hawaii, June 29, 2018 (ENS) – Noxious sulfur dioxide (SO2) fumes from Kilauea volcano’s summit have dropped to half the levels before the eruption activities began on May 3, according to a new report from the Geological Survey (USGS) Hawaiian Volcano Observatory. Still, volcanic gas emissions remain high from Fissure 8 and elsewhere along the East Rift Zone. These emissions are punctuated by bursts of ash and gas from intermittent explosive activity in Halema‘uma‘u Crater. Geologists say there is no clear end in sight for the current phase of the eruption. “Volcanic gases and ash are generally being transported downwind, but it is difficult to accurately predict ambient air concentrations anywhere on Hawaii Island, which vary considerably depending on wind direction, topography and other factors,” said Health Director Dr. Bruce Anderson. Kilauea, the most active volcano on the Big Island of Hawaii, has been in continual eruption since 1983. The current eruption is close to the residential subdivision Leilani Estates, where a new volcanic cone has developed. Kilauea is supported on its northwest side by the much larger Mauna Loa volcano, but its unsupported southeast slopes face the ocean. 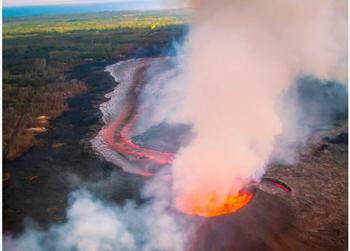 The U.S. Geological Survey says 23 separate new fractures there have became volcanic fissures from which lava is flowing. Fissure eight is now the most active. For now, the Hawaii Department of Health, DOH, is ramping up its air quality monitoring efforts to ensure emergency responders, residents, and visitors have accurate and up-to-date information on particulate and sulfur dioxide levels. The goal is to make data available over the months and years to come as the island adjusts to the long-term geologic changes brought by the East Rift Zone eruptions. DOH is investing more than $1 million to install 10 new long-term stationary air quality monitoring stations at strategic locations across Hawaii Island, as well as mobile laboratories, to create a robust data gathering system. The state is applying for federal funds to help cover the costs of the new equipment and installation of the new air quality monitoring stations. Gov. David Ige’s second supplemental proclamation signed on June 5, extended the disaster relief period in response to the ongoing Kilauea eruption through August 4. This grants DOH authority to access special funding to partially cover the cost of response activities. Currently, the DOH has five long-term stationary monitors located in Hilo, Kailua-Kona, Mountain View, Ocean View, and Pahala. A sixth station, located in Leilani Estates, is presumed to be covered in lava, as are many homes in the neighborhood. * – In phase one, implemented last month, the U.S. Environmental Protection Agency provided equipment to supplement DOH’s long-term stationary monitoring stations. EPA also provided technical assistance to install more than 15 temporary air monitoring stations in the Kilauea East Rift Zone and at other locations on Hawaii Island to support emergency response activities. * – In phase two, now underway, DOH will strategically deploy mobile monitoring equipment to replace the EPA’s short-term monitoring instruments. Locations for this equipment – anchored by the mobile laboratories – will depend on the emergency response needs during the ongoing Kilauea volcanic activity. To assist Hawaii’s air monitoring efforts, organizations such as the California’s South Coast Air Quality Management District have generously loaned Hawaii some of their air monitoring equipment. The equipment on loan will be replaced as new equipment is received. * – DOH is simultaneously moving forward with phase three, which includes the placement of 10 new long-term air quality monitoring stations to supplement the five existing stations on the Island of Hawaii. The Department of Health, with input from the public, has already identified 10 locations for these permanent monitors. In addition to providing real-time air quality data, the Department of Health has begun to look at ways to more accurately predict air quality conditions to better serve Hawaii Island residents. The health department’s Clean Air Branch is now evaluating forecasting models and tools that can be incorporated into its air quality monitoring program.